Writer Dalton Trumbo was one of the infamous Hollywood 10, that list of 10 Hollywood screenwriters whose political leanings got them blacklisted, jailed and kicked out of a guild they helped create. Hollywood did to them what the Germans did the “degenerate artists” twenty years before. Trumbo was probably the best of these writers and wrote a mind boggling number of excellent scripts, from his bathtub, as he smoked through 6 packs of cigarettes with his parrot on his shoulder, cheering him on. 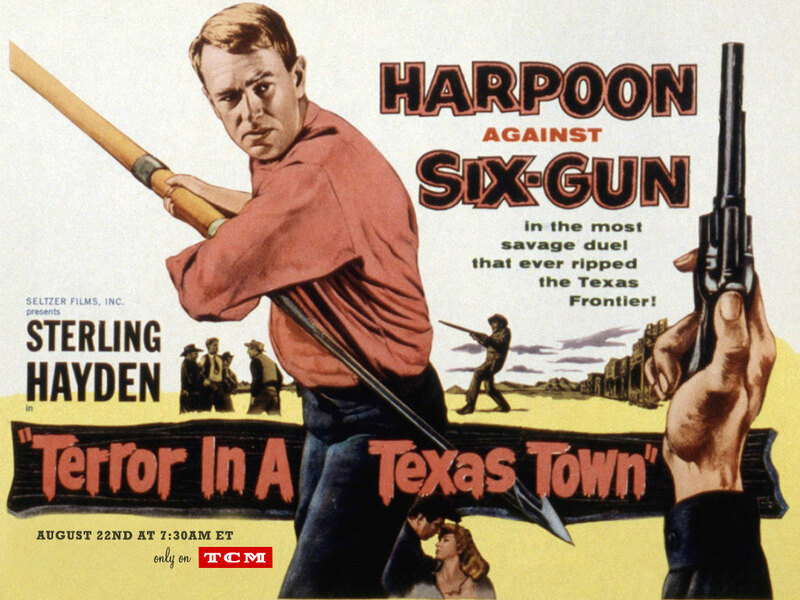 Only such an eccentric original could have fashioned Terror in a Texas Town (1958). Team Trumbo with B-movie maestro Joseph “Wagon Wheel” H. Lewis and a cast of idiosyncratic character actors and you get a peach of movie such as this. Trumbo wasn’t the only victim of the HUAC (House Un-American Activities Committee) associated with this film. 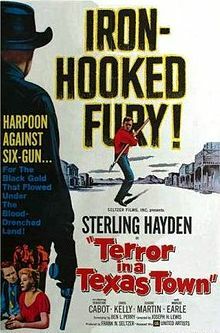 Actors Ned Young and Sterling Hayden were also called before the committee. Young was also a screenwriter. Jailhouse Rock(1957), The Defiant Ones(1958), Inherit the Wind(1960), and The Train (1964) are among his credits, most of which he wrote under pseudonyms. Young refused to cooperate with the HUAC and was blacklisted as well. Hayden caved into the committee and gave them what they wanted, which cost him much in the long run. All this has given Terror in a Texas Town a cult status as a quirky reaction to the HUAC. The reputation is well-deserved. 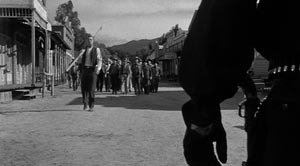 The film opens to George Fried’s bizarre score as Swede George Hansen (Sterling Hayden) walks down a dirt road in the middle of Prairie City, Texas. George is mad as hell, he means business and he’s carrying a big whaling harpoon over his shoulder to prove it. George is followed by bloodthirsty, local farmers who are mad as hell, too. 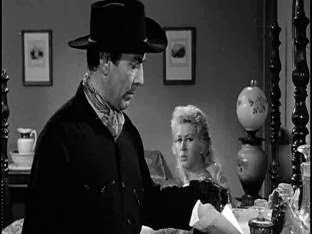 They meet up with the object of their anger; southpaw gunslinger Johnny Crale (Ned Young, uncannily resembling Bogart and dressed from head to toe in black). Johnny is ready to face and kill George. Johnny taunts George, “You’re a little too far away. Come a little bit closer. You wouldn’t want to disappoint your friends. They all came here to see blood. Come a little bit closer so they can see. I want to give you a fighting chance. Five steps. One step, Hansen.” George hangs his head in shame. It seems this is something he cannot go through with. Titles roll through a typical Lewis shot of wagon wheel spokes. The farming townspeople are being bullied and driven out by local oil baron Ed McNeil (Sebastian Cabot, projecting slimy finesse in excellent form). McNeil likes the finer things in life and that includes women, food, champagne and land ownership; but the local farmers are uncooperative when it comes to their land, which McNeil wants to mine. McNeil utilizes the talents of gunslinger Johnny to get his dirty deeds done. Pa Hansen is one of those farmers, and he is murdered by Johnny. Pa’s employee, Jose (Victor Millan, also in excellent form) witnesses the murder, but his wife wants him to remain silent. At this point, Terror in a Texas Town may seem like a formulaic movie, but underneath the surface this is a bleak film, dripping in cynical parody. That becomes apparent when Pa’s son, George, arrives in Prairie City after being at sea for 19 years. George is returning to help his Pa, until he learns the awful truth that his Daddy has been shot and killed. With no help from the townspeople, George intends to find out who killed his Pa and why. 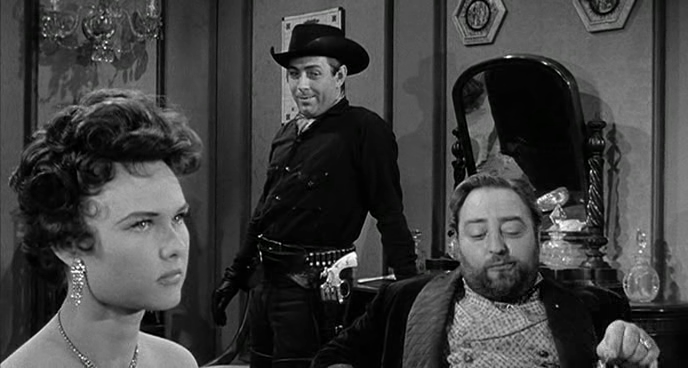 Both the Sheriff and McNeil attempt to coerce George into leaving, but his stubborn refusal brings Johnny in to handle the situation. George befriends Jose and his family, who also are being threatened to leave. After Crane and McNeil’s thugs beat Hansen and put him on a train out of town, Hansen walks all the way back, bloodied and more persistent than ever. 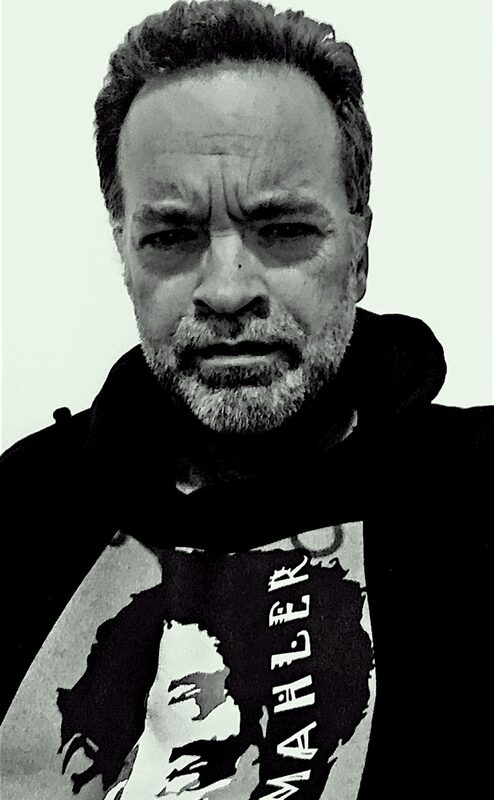 Jose is inspired by Hansen and makes his stand. 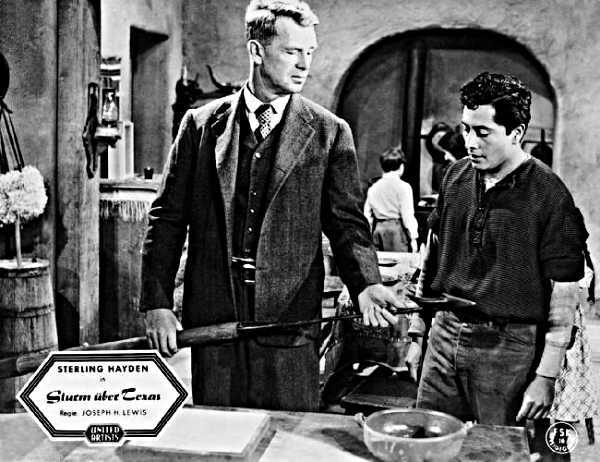 Millan gives a powerhouse performance as Jose when he overcomes his fear and faces Crane, knowing full well that Crane will kill him. The ruthless Crane does just that, but he is shaken by Jose’s courage. 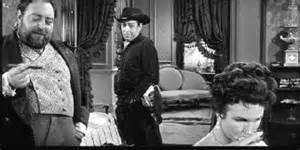 Young is equally superb in this scene and, little doubt, reacted to Millan’s Jose by tapping into his own courage when he faced the Hollywood inquisitors. 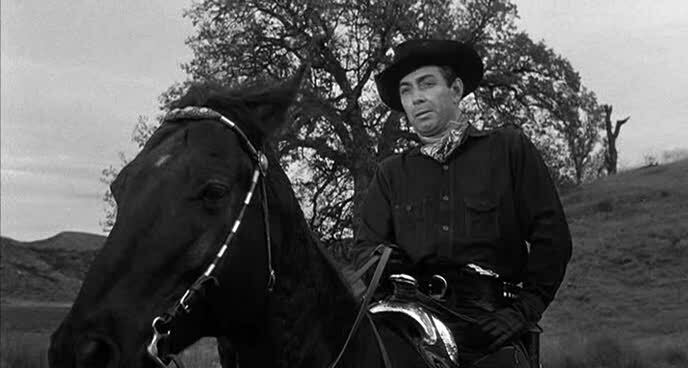 Young makes Crane one of the most interesting, classic western villains, who can stand alongside Lee Marvin’s Liberty Valance and Jack Palance’s Jack Wilson. Crane’s girlfriend, Molly (Carol Kelly) tells him that she stays with him because she can look up to see someone lower than herself. Molly is very attuned to irony. 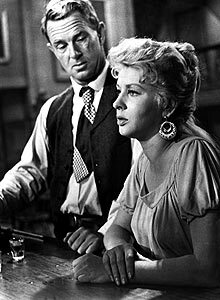 She sees Johnny as an anachronism, forced for years to use his left hand after his right hand was rendered useless in a gunfight. “You’re no good anymore,” she says, hinting at something far more than a paralyzed gun hand. Johnny knows it too; he’s a savage killer riddled with angst. Aptly, George rallies support in a local church, grabs his Pa’s whaling harpoon and heads to one of the strangest shoot-outs in screen history. It’s an odd finale to an equally odd film and film career (it was Lewis’ final film). 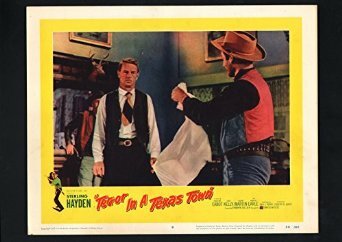 Terror in a Texas Town arrived at the tail end of a politically troubled decade made for this American genre. It makes for a helluva showdown. 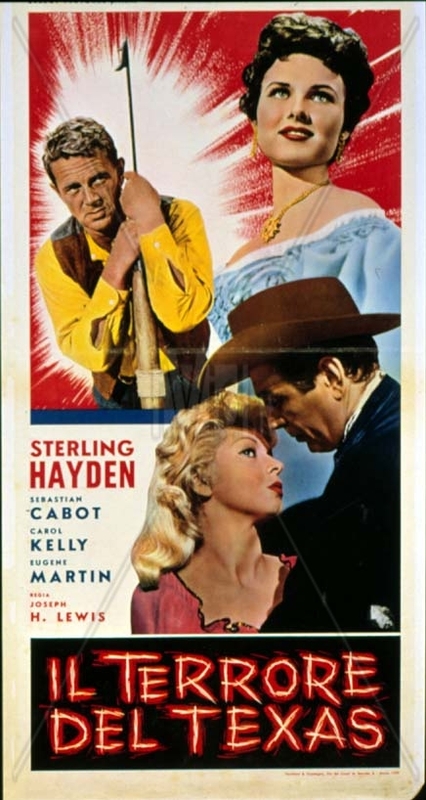 This entry was posted in BLUEMAHLER'S "B" WESTERNS, Film Reviews and tagged "B" Western, 1958, Dalton Trumbo, Sebastian Cabot, Sterling Hayden by Alfred Eaker. Bookmark the permalink.